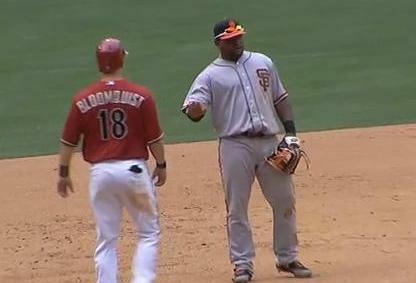 Pablo Sandoval and Willie Bloomquist get acquainted. Less than a week into the season, and we already have sign-stealing controversies breaking out on both sides of the country. The more prominent of the two came in Baltimore yesterday, when Yankees catcher Russell Martin lit into Orioles second baseman Robert Andino as the final out of New York’s victory was being recorded. Andino had been a runner at second, which led to speculation that he was either tipping signs or location, or was doing something that looked remarkably similar to tipping signs or location. Bloomquist had a chance to argue his side of things only moments later, when a walk to Justin Upton loaded the bases, forcing him to third. Sandoval didn’t want any part of an argument and immediately waved away his previous accusation, but by that point it didn’t matter—if Bloomquist had been signaling pitches, he’d already been caught, and his approach was going to have to change. Things will get particularly interesting should such accusations persist the next time these sets of teams meet, or if other clubs begin lobbing similar indictments toward the O’s or D’Backs. Until then, they’ll likely continue to take ’em as they can get ’em—just like always.